The original window graces the entrance to the Mark Twain Memorial in Hartford, Connecticut. Twain was one of Louis Comfort Tiffany's earliest and most famous clients and commissioned him to redecorate his house. 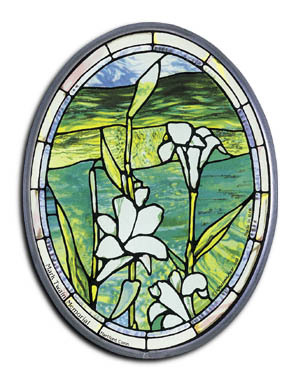 Louis Comfort Tiffany loved flowers and frequently incorporated the lily in memorial windows to symbolize resurrection and eternal life.